Time for bed? Time for Sonic. 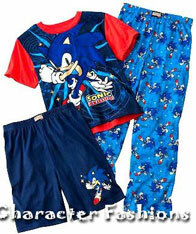 This page has all sorts of Sonic themed sleep wear for the USA. Most of it is modern. You'll find soft pants, sleep sets, and pajamas here. 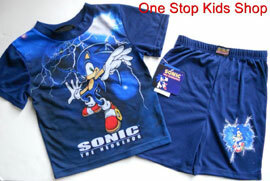 There is a good range of sizes with some things for adults and other stuff in little kids sizes. 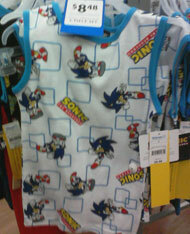 Wal Mart seems to be pretty big on having Sonic sleep stuff for sale. 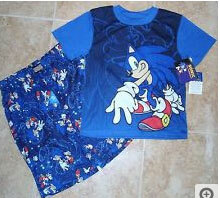 This is a fun pajama set...if you're really litte. 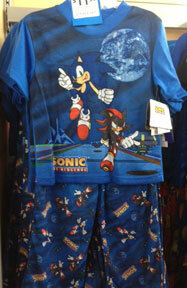 Sadly, this Sonic Knuckles Sahdow PJ set only comes in small kids sizes. 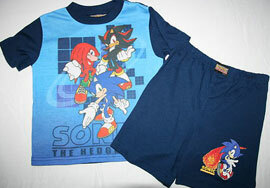 It looks nice though, with blue fade for the shirt, cool poses for everyone & speed-lines for Knuckles' fist. 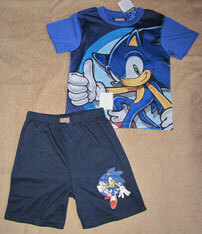 The shorts have the modern logo on the waist band & added Sonic with (fireball? comet? what is that?) graphic beside him. 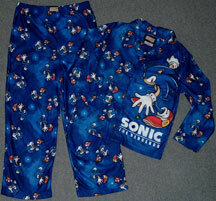 Having a Sonic element on the matching shorts is always a good idea. Where is this set sold? 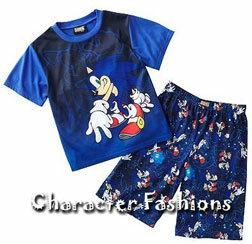 Inspect this PJ set carefully, super fans! Well well, what is this? It seems to be an attempt at Kigurumi style PJs. Kigurumi is sort of like an animal 'costume' that's a footed pajama. Usually it has a floppy hood with animal features & sometimes a tail. In this case, it's trying to be Sonic like, but where are the spikes? Certainly those wouldn't be comfortable to sleep in...so they seem to have been left off. The footy part is styled like his shoe (did they forget the sock?) The front zips up so you can climb in. 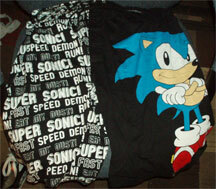 The chest (upper part) has the Sonic logo, meaning the belly dot is a bit lower. It has no gloves, but the sleeve does have a white cuff. 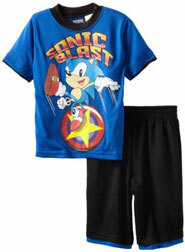 This is adult size only, at Spencers Gifts in 2012. It should be about 24.99. It is sometimes on sale for about 10 dollars. Small sizes sell out first. It looks goofy here, but you could probably work on it to use it as the start of a costume. This is a rather strange item. This is called a 'sleep set' but you could probably wear it as normal clothes. This is likely in kids/boys sizes, though. 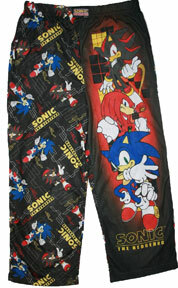 It says "Sonic Blast" with neo-classic Sonic jumping off of a star bumper. The shirt is blue with a black collar & the shorts are all black with a blue border. 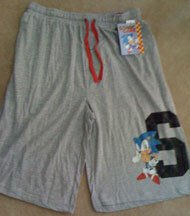 The shorts don't appear to have a Sonic element to them. Where can you find this set? Likely to be a 2013 item. 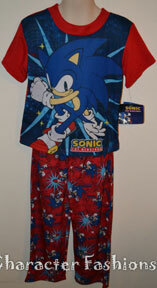 where the shirt has Sonic 'surfing position' (though he's not on anything) in front of a big flash of lightening. The shorts show a different pose on a lightening cloud, & use the logo on the waistband. Where can you buy these? 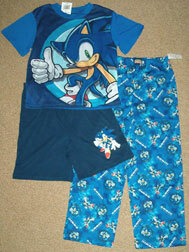 This is a Sonic pajama set, with dark blue varying background. It has a button front long sleeve top, with long pants. You can see the logo there in the back of the shirt and pants. 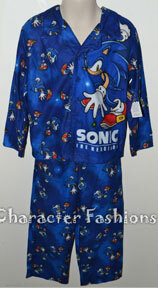 See the big SA1 pose Sonic that takes up half the shirt? That's the only art used for the whole set, so those repeating Soncis you see everywhere, are just more of that same one. It's a little odd to use only 1 pose for a scattered pattern like this. Still, the 1 large design helps break it up a bit on the top. This is like a teens item, but where do you find it and how much is it? Notice how the pattern for the pants is shared with the shorts above. The same company must be doing all of these. The same top with 2 different sets of PJs? What sizes is it available in? How much does it cost? What stores can you find it in? What is the material like for it? Why did they make this in a 2pc AND a 3pc set? Cool & unusual, it's bound to be in-demand. Discovered by A Cat.